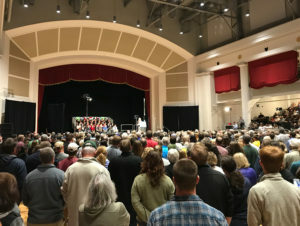 Former Vice President Joe Biden urged a crowd of more than a thousand in Cedar Rapids tonight to help reset the country’s “moral compass” and choose candidates this November who will “dial down the temperature” in politics. 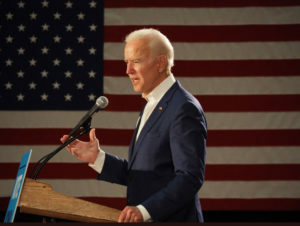 Without directly mentioning President Trump by name, Biden argued Americans are seeking more “authentic” political leaders. Biden spent part of his speech praising the two Iowa Democrats who shared the rally stage with him last night. Both had a chance to make their own case to the crowd. Democratic candidate for governor Fred Hubbell criticized a string of GOP priorities Republican Governor Kim Reynolds has enacted, like “defunding” Planned Parenthood. “It’s time to work across the aisle for the benefit of all Iowans,” Hubbell said, to cheers from crowd. Abby Finkenauer is the Democrat challenging Republican Congressman Rod Blum in the first district. She urged the crowd to keep the “pedal to the floor” until November 6th. “One week to make sure that Washington hears from all the Iowans they have forgotten,” Finkenauer said, to cheers. Finkenauer worked on Biden’s 2008 Iowa Caucus campaign and his return to Iowa last night after a two-and-a-half year absence showcased the message he might present voters if he runs for president a third time. Retired educator Steve Regan of Cedar Rapids said the “negativity, anger and hostility” in politics today is worrisome. To Regan, a former College Republican who left the GOP in 1980, Biden is the only Democrat right now who could win the party’s nomination and beat Trump in 2020. Biden is headed to Missouri tomorrow, part of a tour to campaign for dozens of 2018 candidates around the country.